I am a high school U.S. History teacher and since 2016 have been using Flipgrid — a video discussion platform designed to further K-12 student classroom conversation in a fun and interactive way. Here’s how it works. Since first coming onto the educational scene in 2015, Flipgrid has exploded in popularity and for very good reason. 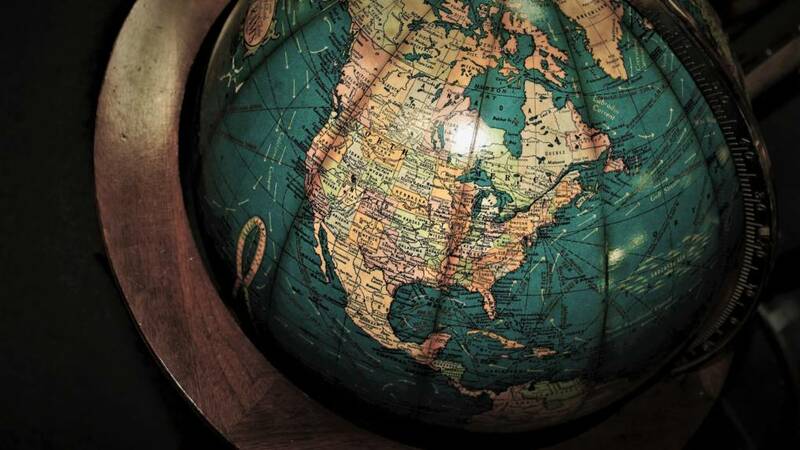 In the high school U.S. History class alone, it’s an especially great teaching, learning and assessment tool. Better yet, it can be used in a variety of ways. And, yes, of course Flipgrid is also used to assess students’ public speaking and listening skills. Yet for as popular and versatile as Flipgrid is, teachers using Flipgrid will probably experience a learning curve before being able to master the platform. The below offers six ways to minimize that learning curve. This makes viewing, grading and evaluating the student videos easier. I open one window for Flipgrid and one window for my gradebook. With only one grid, you will waste time tabbing between the class periods in your gradebook as you view individual responses and try to remember which period that student is in. It is hard to record in a class of 36, so most of my students record their videos at home. Since some do not have reliable access to the internet, I give students a range of days to complete their Flipgrids. This teaches students to be problem solvers. They figure out a way to get their work done whether they use the computer lab after school, go to a friend’s house or visit the public library. Don’t make all five classes turn in their Flipgrids at the same time! You just gave yourself 180-200+ videos to review. Make period one due on Monday, period two due on Wednesday, and so on. This makes it much easier for you to provide timely feedback without going crazy. If you ask all of your students to summarize how the Panama Canal was built, you are going to get 180 plus videos that say the same thing. Your feedback will be repetitive, monotonous and you will want to stab yourself before you are halfway done. The reply that appears below was to a student who mispronounced key names practicing his speech on Flipgrid before giving the speech live in front of the class. Yes, Elvis was the student’s real name. Don’t be cruel. I like to use Erik Palmer’s PVLEGS framework and evaluate student speaking one element at a time. 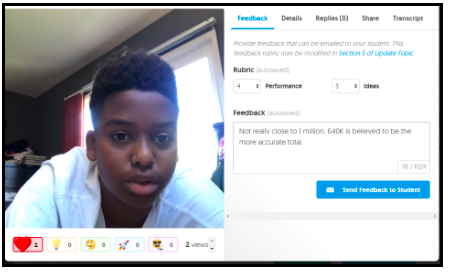 Flipgrid’s feedback tool allows you to quickly assess student ideas and performances along a five-point scale. Require that students provide their email address when recording a response. Otherwise, they will never see or hear your brilliant advice. I was able to correct this student’s error in the number of men killed in the Civil War before he printed out his paper. 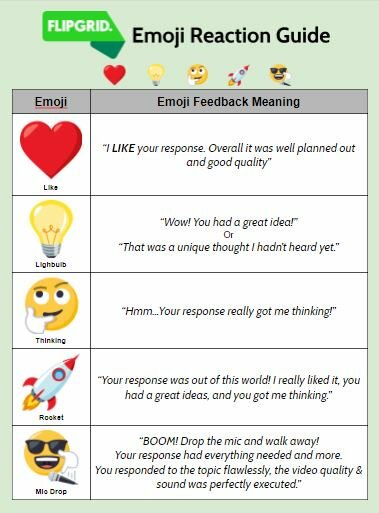 This Flipgrid Emoji Reaction Guide, created by @seanjfahey, is another pretty awesome way to provide students with some feedback. When I started using Flipgrid for the first time, it was August and incredibly hot in Southern California. I got videos from 11th grade students whom I will call shirtless boy and sports bra girl. Remind your students that Flipgrid is a social platform so their peers, parents and maybe even the principal will be viewing their videos. You should caution students to avoid distracting background music, gum chewing, bad lighting and inappropriate language. Using Flipgrid too frequently will burn out your students on a great tool. When I first started, I got so excited by the tool that I assigned weekly Flipgrid assignments, which stressed out my students and participation plunged. Now I try to make my Flipgrid assignments a thought-processing piece on the way to a bigger project. I only assign them once or twice a month now. 6. Leverage the Flipgrid community online. Follow @Flipgrid on Twitter. Scroll through the hashtags #Flipgrid, #FlipgridFever and #FlipgridAmbassador. This user base is not shy about sharing its best practices. Check out the Topic Discovery Library and begin learning from creative teachers on a regular basis. In the comment section below, I would love to hear about the Flipgrid assignments that you have created to challenge your students.